Maintaining one’s fitness at a local gym is a popular activity for many Americans across the country. A gym is an environment with workout equipment where people go to get in shape. Workout machines are meant for individuals with the proper strength and knowledge to test their might and strengthen themselves, however, most gyms will offer workout machines with certain built in safety measures to help prevent accidents, or take certain precautions to ensure that if an accident does happen, its damage mitigated. For one woman in Sacramento, this was not the case. Jimenez, with the help of her attorney, has since filed a case against 24 Hour Fitness. The case rests on the claim that while the treadmill may have been functional, the positioning of the equipment behind the treadmill was incredibly unsafe, and contributed to the severity of Jimenez’s injuries. 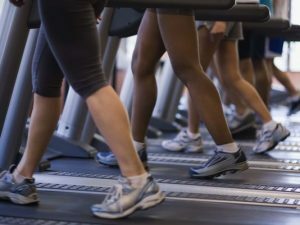 Citing the factory safety manual of the treadmill, Jimenez’s attorney pointed out that the minimum space behind the treadmill should be at least six feet away from walls or other objects. Upon reconstructing the scene of the accident, it was determined that there was a distance of just 3 feet and 10 inches between the edge of the treadmill and the workout machine that Jimenez collided with. Normally, taking legal action against a gym or fitness center can be difficult. Usually, in order to enter into the gym and use its equipment, members must sign a liability release. These documents typically contain language that releases the gym and its employees from “any and all” responsibility for a person’s injuries. Jimenez’s case was initially denied because of her liability release, but the case was later pushed forward in an appellate decision because Jimenez did not have the ability to read or speak English, and the waiver was in English. In the news report, neither Jimenez nor her attorney specified the amount of damages sought, however, the lawsuit seeks damages for high medical costs, lost wages, and pain and suffering. The case will find its way into a full trial next February. Going to the gym is a healthy pastime, but can be the source of serious injury. If you or a loved one has been injured in the state of New Hampshire, contact the personal injury attorneys at Tenn And Tenn today.